It’s been a long cold winter here in the Big Apple but it’s finally getting warm and it’s time to get out and do something fun! Kick Spring into high gear with the 3rd annual NY Burger Crawl. At every single stop, you’ll enjoy an 8oz Beer from Amstel Light, the official beer of the Burger, along with $3 specialty mouth watering Burgers. The event begins at 1pm and goes until 7pm. For those six hours, how many burgers can you handle? Call your friends, get a group together, and enjoy some of the best burgers in NYC. 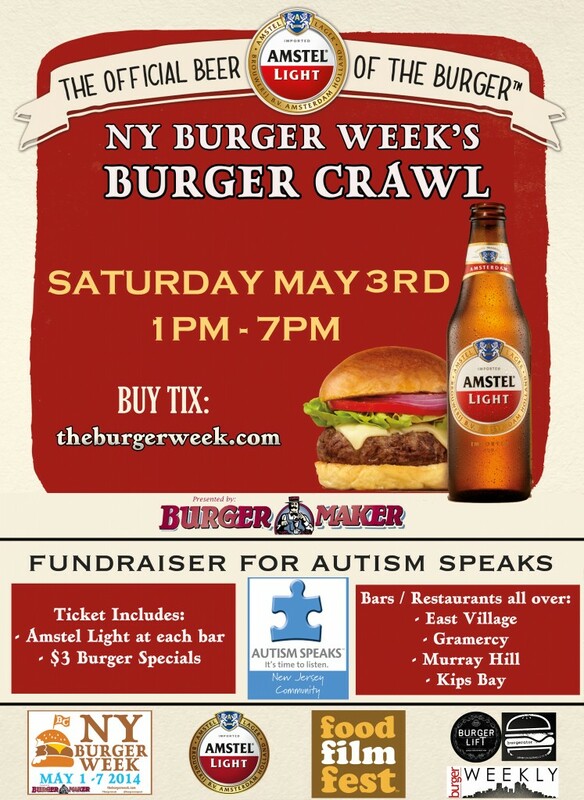 A portion of the proceeds to the Amstel Light NY Burger Crawl will be donated to Autism Speaks. At Autism Speaks, their goal is to change the future for all who struggle with autism spectrum disorders. They are dedicated to funding global biomedical research into the causes, prevention, treatments and a possible cure for autism. They strive to raise public awareness about autism and its effects on individuals, families, and society: and they work to bring hope to all who deal with the hardships of this disorder. The organization is committed to raising the funds necessary to support these goals. Autism Speaks aims to bring the autism community together as one strong voice to urge the government and private sector to listen to our concerns and take action to address this urgent global health crisis. It is their firm belief that, working together, we will find the missing pieces of the puzzle. Click here to donate to Autism Speaks. A Burger Crawl is a unique way to spend the day visiting great bars with close friends and family. Enjoy some of the best burgers that Manhattan has to offer at an incredibly affordable price along with great beer. This package will allow you to take advantage beer deals, burger specials and a full map of the best bars to visit during May 3rd for the annual NY Burger Crawl. While the weather warms up, what can possibly be better than a cold beer and large juicy burger? Enjoy all of this at some of the top rated burger joints in town. Some of the best bars have enlisted to participate in this year’s Burger Crawl. 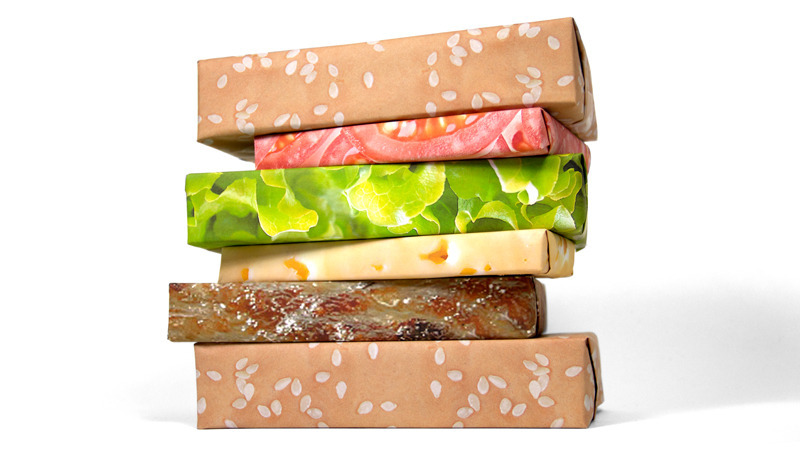 By purchasing at ticket to the Amstel Light 3rd Annual NY Burger Crawl you are entered into a chance to win Cheeseburger Wrapping Paper from Gift Couture. Winners will be chosen the week after the event and will be notified by email. While out on the crawl, you’ll also get a chance to check out the new Burger rating app from Burgerator. It allows you to share photos and review of Burgers with your friends. When you check in at Idle Hands Bar, you’ll get a chance to meet the crew from Burger Lift. Their new device, which just had a successful kickstarter campaign, helps you maintain Bun integrity by giving you a stand to place your Burger on top of. That way when all the juicy goodness falls to the plate, it won’t get sucked up and ruin your bun. Brazen Fox Kitchen & Craft Beer Company – Slider topped with Blue Cheese Bacon and Onion Mayo. 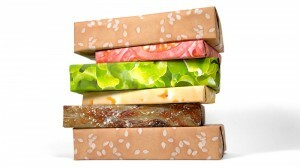 This entry was posted in Bar, Beer, Burger Week, Burgers, East Village, Event, Hamburgers, National Hamburger Month, New York, NY Burger Week and tagged amstel light, autism speaks, autism walk, Bar, Beer, best burger, breweries, burger, burger crawl, burger lift, burger maker, burger weekly, burgerator, Cheeseburger Wrapping Paper, ciancio, craft beer, david, events, Festival, food festival, food film festival, Gift Couture, gourmet burger, happy hour, ny burger week, nyc, pairing, party, restaurant, rev, sidebar, the burger week, village pourhouse. Bookmark the permalink.